A TEAM of eight university students designed a footbridge system where people walking on it can generate electrical energy. The students are from the City University of Hong Kong, the University of Hong Kong, Chinese University of Hong Kong as well as Ryerson University in Canada and University of Technology Sydney in Australia. The footbridge will use different renewable energy systems, including solar power and a system called ‘piezoelectricity’ where the bridge can generate power when people are walking on it. The team hopes that the footbridge system can reduce traf.c pressure in the Yuen Long district. 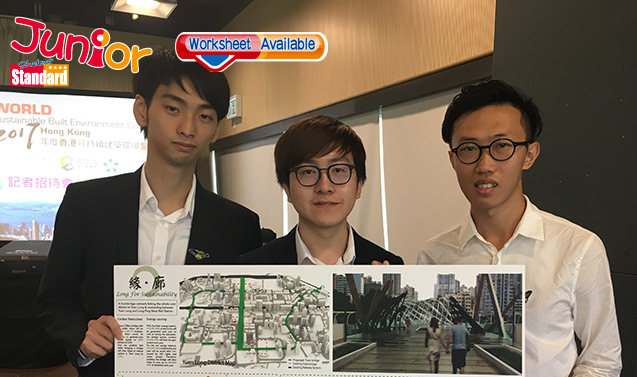 The footbridge was among eight winning entries selected from over 100 submitted by teams from all over the world in the International Youth Competition for the 2017 Hong Kong World Sustainable Built Environment Conference (2017年度香港可持續建築環境全球會議─國際青年比賽). The conference will be held next month. Four of the eight winning teams were from Hong Kong. Another local winning entry is Kowloon City Castle 2.0, a sustainable neighborhood that offers good quality of life despite high population density.